1. Rinse your hair with cold water instead of hot. Hot water expands the hair cuticle, which can make your mane look frizzy and dull. Cold water helps smooth the hair cuticle for shiny, silky strands. 2. Always check the ingredients in your hair care products to make sure they don’t contain sulfates (SLS and SLES). Our go-to, sulfate-free wash is As If I Hair™ All-Purpose Shampoo. It’s filled with quinoa to help fortify hair so it looks stronger and healthier while smoothing and hydrating with olive and coconut extract. Using a wide-toothed comb(key word WIDE) in the shower helps conditioner evenly coat strands without tugging on hair. If your scalp is dry, condition from your roots down. For oilier scalps, concentrate conditioner from the middle of your strands down to your ends. All hair types can benefit from Tressed to Impress™ All-Purpose Conditioner with abyssinian oil and vitamin B5. 4. Avoid rubbing your wet hair with a towel. Terry cloth can rough up your hair cuticle, resulting in frizzier hair. 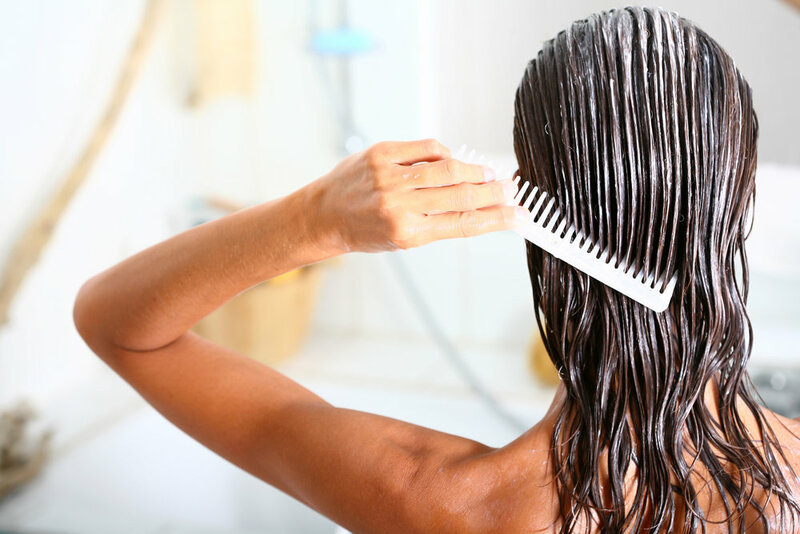 Plus, when hair is wet, it’s more susceptible to breakage, so rubbing with a heavy towel is less than ideal. Gently blot out excess moisture with a T-shirt or, even better, a microfiber towel. FYI one little trick a dear hairdresser friend gave to me and what she uses in her salon is T-Shirts!!! What?!?!?!?!? She uses T-Shirts to dry hair instead of towels, they are more gentle on hair and just as absorbent! So before you throw out your old holy t's put them in the linen closet and use them to dry your hair instead! 5. To reduce breakage, don’t tie your hair up when it’s wet or damp. Hair stretches when it’s wet, sometimes as much as 30%. If you pull your wet hair back, as it dries it becomes less elastic, causing tension and breakage. That means no ponytails or braids or clippies!!! Also remember I have mentioned before about putting a BRUSH in wet hair. That is a NO NO! 6. Treat your hair (and scalp) the same way you treat your face. What one product can give you beachy waves, tons of texture, vixen-like volume, and even help you hold your top knot? A salt spray like Beach Hair, Don’t Care™. Salt sprays like this one work without sulfates to amp up your hair’s natural wave. Stick straight? Salt spray also helps to lift roots for much needed volume and lock slippery strands in place. Incorporate these 7 steps into your hair care routine or just pick and choose what works for you. You’ll have the hair you’ve been wishing for in no time! I know I know you all think I wrote this with the motive to get more business but I will be honest I did not join Perfectly Posh until after I tried all of these products until they were empty so I could decide if I truly liked them before I would endorse them!